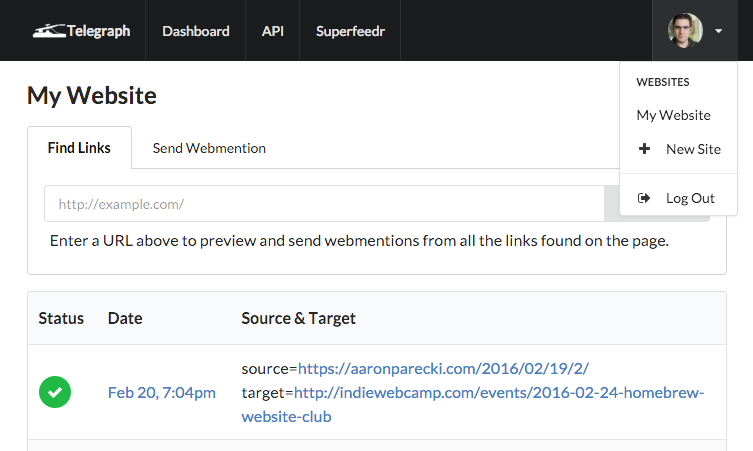 You can use Telegraph to receive Webmentions when your site is linked to by any website tracked by Superfeedr, even if that site doesn't send Webmentions itself! From the top right menu, click the "New Site" link. Enter "Mentions" for the name (or anything you want, but that's what I use), and enter your home page URL. 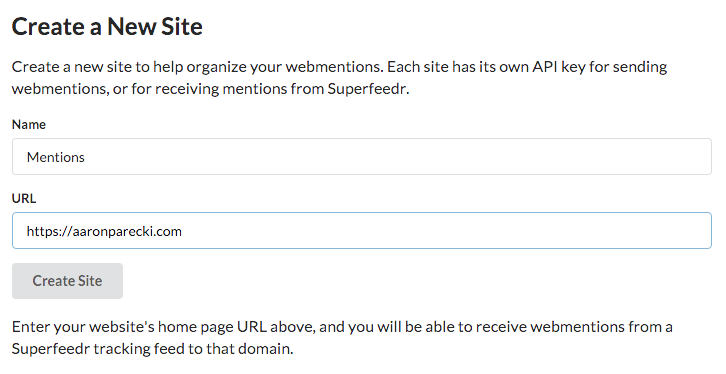 Entering your URL here is how Telegraph knows which links in the Superfeedr feed to send webmentions for. Near the bottom, there is a Superfeedr Webhook URL. Copy that URL since we'll need it in the next step. Now we need to sign up with Superfeedr and create a tracking feed. Create an account by visiting the Superfeedr Tracker page. Make sure to choose "Tracker" from the account type dropdown. If you already have a Publisher or Subscriber account, you'll need to make a new Tracker account for this. 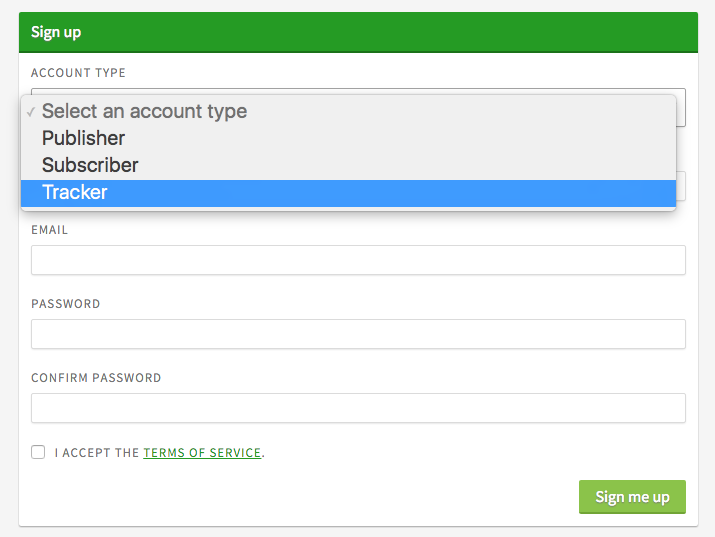 Once you've signed up, you'll land on the Superfeedr dashboard. 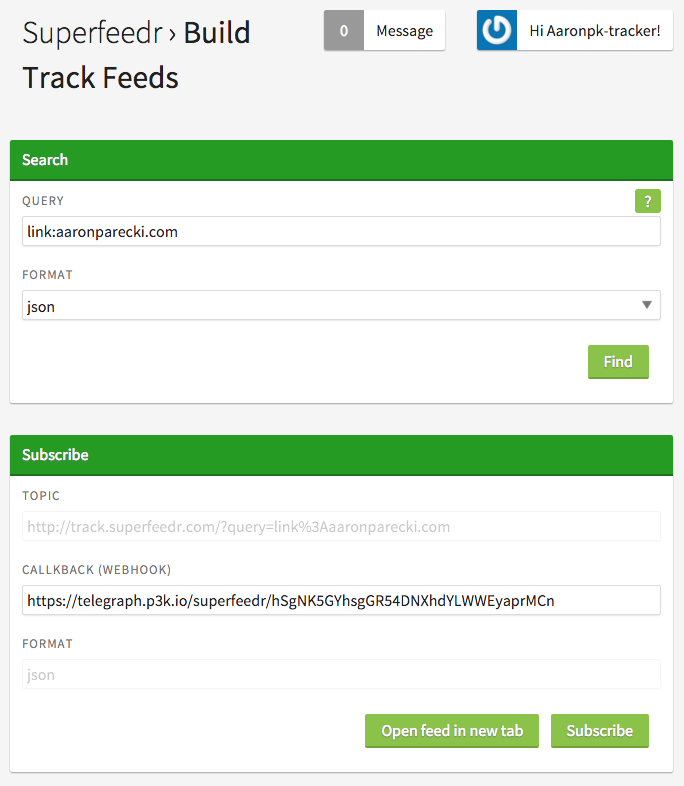 Click "Search and Track" to create a new tracker. Enter link:aaronparecki.com as the query term, obviously replacing the domain with your own, and set the format to "json". Paste your Telegraph URL from the setup process into the Callback/Webhook URL field. Then click "Subscribe"! Unfortunately nothing will happen right away, so you'll have to wait for someone to publish a blog post that links to you. 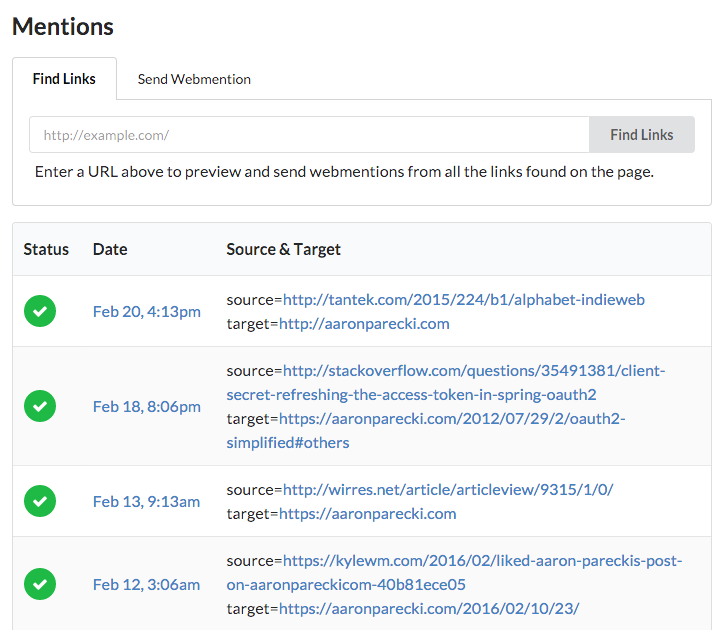 Check back in a little while and you should see some webmentions show up on your Telegraph dashboard! Here you can see a few of the mentions I've received from my Superfeedr tracker, including one from Stack Overflow which doesn't yet send webmentions on its own! Telegraph and p3k are part of the indieweb. To learn more about the indieweb and IndieWebCamp, visit the wiki or join the IRC channel. Telegraph is built and maintained by Aaron Parecki.